3-rep Chins: 185.5 lbs. (bodyweight) + 55 lbs. = 240.5 lbs. Pretty darn good. I woke up with a little stiffness in my low back but I don’t think it really affected anything. Squats in particular felt great. I did try for a 400 lb. deadlift but I couldn’t get it off the ground. All in all it was a great starting point. I think the fact that I could get these numbers while not really training purely for strength shows that where I have taken my training in the past year and half has been well worth it. It will be very interesting to see where I can go from here. I think these are really good starting numbers and it won’t be easy to improve, but considering that my focus now will be purely strength I think I can and will show some big increases. I will keep you updated. The program starts on Monday. 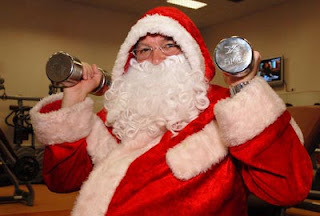 Santa needs to get in shape for his big night! Hopefully everyone is doing well. I am excited. Why am I excited, you ask? 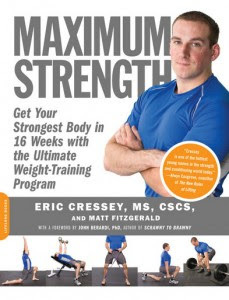 I am excited because this weekend I am starting the Maximum Strength program that I mentioned in my last post. Here’s the book cover if you need reminding. Technically I start the program on Monday, but on Saturday I am doing all my pretesting for my 1 rep max lifts. A big thanks to Tim for coming in to spot me during the squat and bench press lifts. It’s been a long time since I have done one rep maxes so it will be interesting to see where the numbers are. The most I’ve ever deadlifted is about 405 lbs. and the most I’ve ever benched is 270 lbs. Those were both done quite a while ago. I’ve never really done a 1 rep max on squats. The book also has you do a 3 rep weighted pullup and a broad jump. If I can hit about 240 on bench, 350 deadlift, 315 squat I’d consider that a good starting point. The interesting thing is that I haven’t back squatted for quite a while. All my squatting has been front squatting with the exception of the very beginning stage of the “New Rules of Lifting” hypertrophy workouts that I did. I tweaked myself back squatting about two workouts in and switched to front for the remainder of the program. Another interesting change is that the book has you mainly doing box squats which I have never done before. I did do some light ones this morning and they felt pretty good. Concentrating on the box (or bench) really makes you push your hips back to start the movement. I was planning on only doing a couple of sets at 135 to get the form, but they felt so good that I went to 225 for the second set and did 6 very easy reps. I had plenty more in the tank. It felt good, so that’s a good sign. I also did some light deadlifting and really nailed my form on the bench press. I made a slight adjustment on the eccentric (lowering) part of the movement. I really concentrated on meeting the bar with my body, almost coming off of the bench to do it. It really helped my explosion at the beginning of the movement, making your body almost like a piston or a hinge. When you combine that with the leg drive created by bringing your feet way back below you, I think it will definitely help my number there. Anyway, I will post my numbers this weekend and we will see where we go. I’m excited to get started. One more thing, I had an email read on a great Philadelphia Eagles podcast called Eagles Fancast. You can go here http://eaglesfancast.net/blog/ or download the latest episode on iTunes. My email is read about 25 minutes in. You should listen to the show in any case, though, because the guys on there really do a great job. To remind you of better days I just found one of the all-time great Eagles plays on Youtube. The famous Randall Cunningham bomb to Fred Barnett against the Bills. I was watching this play when it happened and I couldn’t believe my eyes. Cunningham was really something special. Enjoy. 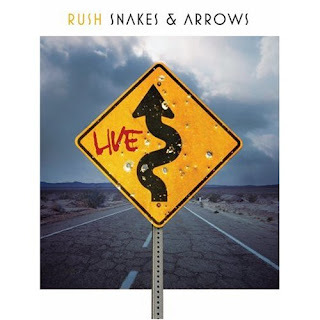 This is a video from the new live Rush DVD. It is, of course, excellent. They are still a phenomenal band. They are playing as well now as they ever have. It’s great to see. I honestly can barely remember a time in my life when they were not my favorite band. Enjoy this and pick up the DVD. In the next couple of weeks I am going to start the program from Eric Cressey’s Maximum Strength book. It’s a great book and I can’t wait to see how the program works for me. It really focuses more on strength than size and it will a little different training style for me but I am really looking forward to it. Cressey’s writing has really made a lot of sense to me as far as goal setting and shifting the focus away from form to function. I have been doing that over the past eighteen months or so, but I am ready to take the next step to see where it goes. What I’d like to do is go through the next 16 weeks on this program and then maybe join a powerlifting-style gym next summer to see where that might take me. I am really looking forward to getting into the next level of my training. As far as my current training goes, I have had a bit of lingering cold this week. I really felt it the other morning in the gym although my lifts weren’t that far off. I actually felt pretty good this morning. I had my form for cleans as good as I’ve had it in a while. (Keep the hamstrings fired!) I need to remember that these are not deadlifts! I’ve been so focused on deads lately that it’s easy to forget the differences in form between the two. I also need to focus a little more on some cardio, too. I’m looking a little puffy around the middle. Break out the Cosgrove complexes article again. That’s really about it. Life is good and extremely busy. I will leave you with one of the funniest things I have seen in a long while. Pay extra attention to the song that that they play while painting. Ciao!